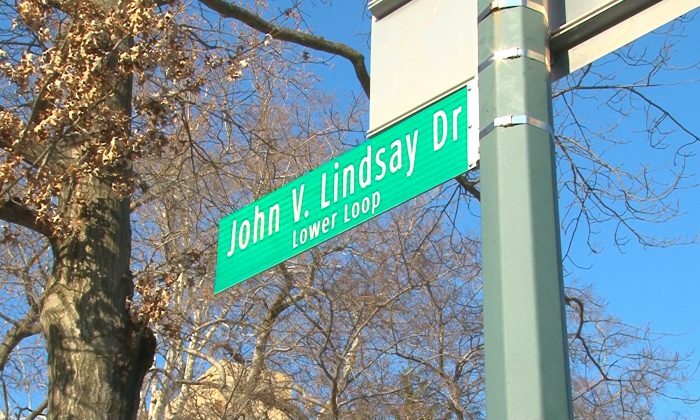 NEW YORK—The Lower Loop of Central Park Drive was renamed after ex-mayor John Lindsay, who began the tradition of closing the park to car traffic on weekends in 1966. Dozens of family members, city officials, and those who remembered the late mayor gathered despite the winter chill to watch the unveiling of the new sign. Closing the park to cars on weekends was only part of Lindsay’s legacy of making the city’s greenscape more accessible. He also closed Fifth Avenue to car traffic on Earth Day in 1970 and did so every Sunday after that. “The moment you took cars out of the park and people could come back into Central Park, and see it for the beautiful magnificent green world that it was, people started coming back,” said Central Park Conservancy President Douglas Blonsky. NYC Parks Commissioner Veronica White believes Lindsay inspired his generation, but also the many generations after him. “Since then, we’ve done so much to open up to bikes, to pedestrians,” White said. Joseph Viteritti, who worked on Lindsay’s upcoming biography, said the mayor’s legacy lies in his commitment to equality and addressing issues of social justice. Lindsay’s former administrative assistant, Sid Davidoff, said he remembered the time when Mayor Lindsay would ask him to go for a ride on a bike in Central Park. “By the time he got here there would be tens of people behind him, and by the time he finished the ride, there would be hundreds of people behind him saying ‘Thanks man, thanks Johnny,’” Davidoff said. After a few opening remarks and a few personal stories, family members were invited to pull a green cover off the green street sign. George Lindsay Jr., the mayor’s nephew and godson, said that closing the roads to traffic seemed like a negligible act in the ’60s.